Using economics to destroy is perhaps the sickest manifestation of the dismal "science." This is mostly because sanctions only really work when the target is weak. As the world is fast finding out, the Russians may no longer be a superpower but they still have the tools to counter a few sanctions. In fact, the economic adjustments forced on the Russian Federation with the latest round of sanctions may have done their economy a world of good. They have discovered that lots of folks want what they can make, grow, and sell. The Russians have also discovered that their own economic weapons are quite effective. European agriculture is still staggering from the loss of their Russian markets while Russian agriculture is arguably doing better than at any time in the past century. And as Tom Luongo points out below, their presence in the market for the fuels that run the world's nuclear power plants is quite significant. But lost in all the discussions of who can do what to whom is the fact that all these sanctions and counter-sanctions diminish everyone's economic possibilities. Building the sustainable civilization will be an act of cooperation�NOT confrontation. And the biggest loser of all is very likely the USA�the biggest sanctions bully on the block. Lost in all of this talk about the U.S. Congress adding sanctions onto Russia is Russia�s unique placement in the world�s Uranium industry. So much focus is placed on its Oil and Gas industry (and specifically the share of its exports) that it blinds our analysis to the how strong Russia�s position in world nuclear power is. And, so, John McCain can grandstand all he wants about how Russia is nothing more than a �gas station masquerading as a country� what he doesn�t want to admit to himself or the world is that Russia is more central to the world�s uranium fuel market than Saudi Arabia ever was to the crude oil market. Russia�s power in this industry doesn�t come from its production of Uranium Oxide (U3O8 or yellowcake) it comes from owning 45% of the world�s enrichment capacity into a usable fuel. Russia only produces around 3,000 tons of U3O8 annually. Kazakhstan is the world�s largest producer of yellowcake with the world�s largest reserves. Do you seriously think Kazakhstan, one of Russia�s strongest allies, is going to go it alone in one of its major industries if the new Cold War between the U.S. and Russia intensifies further? I have two words for you. Hell and No. Canada�s Athcabasca Basin in Saskatchewan has been instrumental in expanding world yellowcake supply in recent years. But, that�s not changing the dynamics of the industry, it�s just keeping Urainium prices depressed. Because, the issue isn�t ore production but turning that ore into usable fuel, called Single Work Units (SWU). And the U.S. and Canada are not interested in refining Uranium due to environmental policy. I�ve heard nothing from the Trump administration on this either, so, nothing is going to change in a way to affect current or fear future events. Rosatom, the Russian State Nuclear Energy company, has tremendous leverage. The faux outrage over Hillary Clinton selling 20% of U.S. Uranium reserves to the Russians is irrelevant. I will paraphrase her for the only time in my life, �What difference does it make� to expand ore production when the Russians effectively control the refineries? Because due to policy changes over the past twenty years the U.S. has no ability to credibly produce its own nuclear fuel. So, improved Canadian ore production still has to be shipped to Russia or Europe for processing. Moreover, look where future enrichment capacity is coming from� China. And all that will do is help China supply itself with fuel for the power plants Rosatom is currently building for them, India, Turkey, Iran, and pretty much the rest of the world that wants nuclear power. 19.5% of our electricity comes from Nuclear Power. 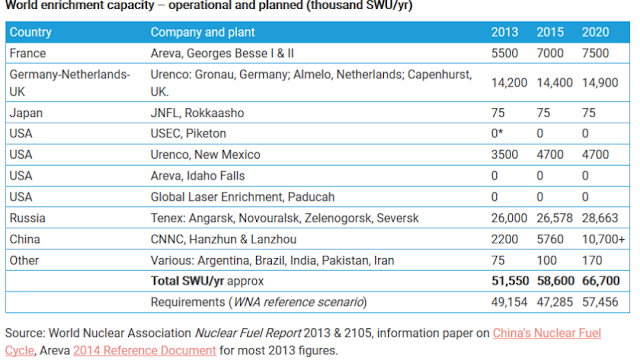 The base load of the U.S. electricity grid is supplied by Russian SWU�s, folks. Without relations with Russia there is no air-conditioning. That�s where it was purchased from, not where it was processed. Crude Oil wells are not an energy infrastructure. Refining and distribution is. We may purchase it from Kazakhstan, but it still has to go through one of the processors above. I�m simplifying this for discussion purposes, but you should be getting the picture. All discussion about U.S. energy security is a non-starter until we discuss Uranium. It is the limit at which the U.S. Congress can make noise until Putin has had enough. You notice he never talks about it. No one does. Because, all puns intended, this is truly the �Nuclear Option� in geopolitics. It is the hammer that can be brought down once the world is in an SWU deficit, which we are rapidly approaching. Russia�s announcements of expelling some diplomats and seizing property formally used by those diplomats are, in effect, virtue signaling. This is Putin putting on a show before things get serious. The new sanctions bill says nothing about Russia�s nuclear industry. It says nothing about German or French companies being sanctioned for doing business with Russian nuclear exports or processing Russian yellowcake into fuel. It can�t say anything about this and John McCain bloody well knows it, otherwise the Russian response is to turn to Kazakhstan and put a hold on exporting another SWU to the U.S.
And that ends the discussion of the U.S. being a world manufacturing anything. Our electricity grid is already over-taxed. The base load from our nuclear plants is our comparative advantage economically-speaking. That will erode over the next decade as China and even Russia expand their use of nuclear power. Again, China�s embracing of solar is all Keynesian pump-priming make-work. It�s not a solution to their energy problems. Russian Oil, Gas and Uranium is. If things get really testy over the Nordstream-2 pipeline with Germany, then you can bet that becomes an issue as well. This is why the sanctions are so stupid. They are driving Germany into the arms of Russia even faster. They are driving the Russians to deepen ties with China. The U.S. is alienating the very people who it depends on for the energy to run its heavy industry. 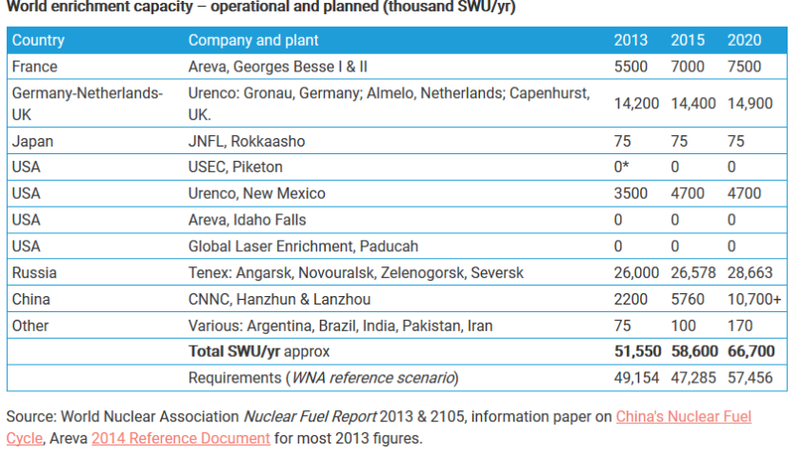 The Germans won�t use the SWU�s they produce anymore, shuttering their nuclear plants, and I�m sure they are selling them to the U.S. for now, but those SWU�s give them a pretty strong bargaining chip in the future of world energy politics. Germany is occupied territory, which limits its responses. Ever wonder why the EU wants its own standing army? So the American bully wants to slap more sanctions on Russia over alleged misdeeds. This is blatant temper tantrums by a frustrated US trying to get �its way or no way�. It�s so absurd. The biggest rogue nation on Earth, illegally bombing and killing civilians in several countries simultaneously, covertly arming terrorist proxies in the Middle East, and a rampant subversive interferer in foreign elections around the world, has the audacity to lecture others about probity, resorting to financial arm twisting that makes a mockery of international laws and trade rules. Well, after all, the Americans do always declare themselves to be �exceptional�. Never a truer word was spoken, albeit inadvertently. This week, the US House of Representatives voted overwhelming to approve tougher new sanctions on Russia. The Senate is expected to rubber-stamp the bill and then President Trump will most probably sign into law. He is becoming a lame duck president due to the rampant Russophobia in the US. Russia�s deputy foreign minister Sergey Ryabkov deplored the latest move to tighten punitive measures on the country�s energy, banking and defense sectors, among others. He said it was a calculated step to destroy any prospect of normalizing ties between the US and Russia. �It is beyond common sense,� said Ryabkov, adding that American legislators �know no restraint in their anti-Russia zeal� and that they are �out of control�. In short, collectively insane. Few sane people � apart from US politicians and media pundits � would welcome a further deterioration in relations between the world�s two nuclear superpowers. And truth be told, Moscow has up to now shown great patience and amenability to try to improve bilateral ties. But the US political class has shown no interest whatsoever in pursuing any reconciliation. It�s like it has a death-wish. American lawmakers endorsing the latest sanctions were almost foaming at the mouth, labelling Russia an enemy and citing unhinged accusations against Moscow for meddling in last year�s presidential elections, also for destabilizing Ukraine and, wait for it, �propping up the Assad regime in Syria� � the country where the American CIA has been propping up head-chopping jihadist terrorists for the past six years. However, let�s step back a moment. Another way of looking at this geopolitical impasse fomented by the US is that it is actually a good thing. US politicians and large sections of the media are so deranged with anti-Russia hysteria and irrational views on international matters, there is simply no chance of engaging them with normal dialogue. Better to let the American political class consume itself with its own toxic paranoia and delusions about the world, and toward Russia in particular. Let them destroy themselves politically in their isolated paranoid state and endless duplicity. A sign of the impending American political self-destruction is the furious reaction from Europe over the latest sanctions. The Europeans are at last waking up to the fact � long overdue � that Washington is acting brazenly for its own selfish interests and is prepared to inflict pain on Europe, if needs be. The European Commission, which oversees EU trade policy, as well as Germany and Austria have expressed outrage over Washington�s �hidden agenda� which is disguised in the self-righteous and disingenuous rhetoric of sanctioning Russia. Germany�s foreign ministry sharply criticized America of undermining European energy security and using sanctions as �a tool to advance US industrial interests�. It�s not Russia being sanctioned so much as America sanctioning its own allies. Of course, this is what the whole American brouhaha over sanctions on Russia is all about. It�s got nothing to do with �disciplining� Russia over alleged misdeeds. How could such pious rhetoric be taken seriously from the planet�s biggest rogue state? No, it�s all about foisting American energy gas supplies on to a new European market by displacing Russian exports. When Donald Trump was visiting Poland last month, he made an unvarnished sales pitch to the Poles and other Central European countries to buy American gas. Even though the US supply would be much more expensive than Russia�s. That�s why Trump will likely sign off on the new anti-Russia sanctions. While the president has at times expressed an interest in normalizing ties with Russian leader Vladimir Putin, Trump�s top priority is to promote American trade interests. He wants to reduce the yawning US trade deficit with Europe by forcing the latter to buy American gas, instead of Russian. So much for American capitalism obeying the rules of �supply and demand�. And so much for the Americans declaring to be an �ally� of Europe acting always �to protect� it from �Russian aggression�. The delusional, paranoid Americans would be happy to see Europe freeze to death, being cut off from affordable Russia gas. Washington in its short-sighted stupidity would plunge Europe into economic recession, industrial failure and rising unemployment just to sell the continent more of its own expensive gas. America�s sanctions policy against Russia is a thermometer of grave political ill-health among its politicians and media. If the Americans want to conduct their government business and foreign policy based on delusional hysteria, then let it be. Sooner or later, a nation driven by such crazed thinking will destroy itself and its supposed allies. The outbreak of anger among European nations toward American self-entitlement to damage European interests is also a temperature reading indicating fever pitch out of control. It is an astounding display of arrogance when Washington is, in effect, attempting to overhaul European energy and trade policy for the naked benefit of US interests. American sanctions against Russia are more a cry of desperation by the US political class whose economy is tanking and whose standing in the world is sliding to unprecedented low levels. Scrabbling to offset the historical demise, the idiotic American �leaders� are lashing out with anti-Russia hysteria and damaging blows to even their own supposed allies in Europe. The much-vaunted �transatlantic bond� between the US and Europe was always an over-rated cover for the Americans to lord it over what they considered to be their European vassals. Russia, unfortunately, has been vilified to provide an excuse for this hegemony. But so arrogant, so desperate are the American rulers today that the charade of US-European �partnership� is in danger of unraveling. If such sanctions help cast a light on the decay of America�s once formidable global empire then bring them on. There�s a big multi-polar world out there. Russia, Iran, China and the Europeans, if the latter get their act together, must learn to walk away from the American sulking bully and let it fester in its own decadence.